Chennai, 18th January 2018: Day two of the 68th Senior National Championship for Men and Women saw some fast and furious action in the first half. The morning of day two saw the Maharashtra Women’s team and Women’s team from Indian Railways competing against each other for the first match of day two with the Indian Railways Women’s team securing a comfortable over Rajasthan. The final score at the end of four quarters was Maharashtra 48 and Indian Railways 98. The first Men’s match of the day saw Maharashtra taken on West Bengal with the West Bengal team being victorious. The final score was 49-54. The next Men’s game saw Uttar Pradesh take Madhya Pradesh with the men from Uttar Pradesh being victorious. The final score was 67-57. The next Men’s game saw Chhattisgarh take on Sikkim with Chhattisgarh securing a comfortable victory over Sikkim. The score at end of all quarters was 45-19. The next Men’s game saw Kerala take on Rajasthan where Rajasthan secured the victory over Kerala. The final score at the end of all four quarters was 72-87. The next Men’s game saw Karnataka take on Uttarakhand. This was a nail biting game where Karnataka beat Uttarakhand by just two points. The final score was 85-83. The following Men’s game saw Maharashtra taken on West Bengal. West Bengal beat Maharashtra in a close game where the final score was 49-54. The next Men’s game saw Andhra Pradesh taken on Delhi where Delhi beat Andhra Pradesh in an exciting game. The final score was 50-68. The following Women’s match pitted Gujarat against Uttar Pradesh. Uttar Pradesh secured a comfortable victory over their rivals. The final score was 30-59. The next game saw the men from Arunachal take on the men from Mizoram. This low scoring game saw the men from Mizoram come out on top, with the final score being 28-56. The next game saw Goa take on the Services team, where the Services team demolished their opponents. The final score was 26-87. The following Men’s game saw Chhattisgarh take on Sikkim where Chhattisgarh dominated their opponents. The final score at the end of four quarters was 45-19. 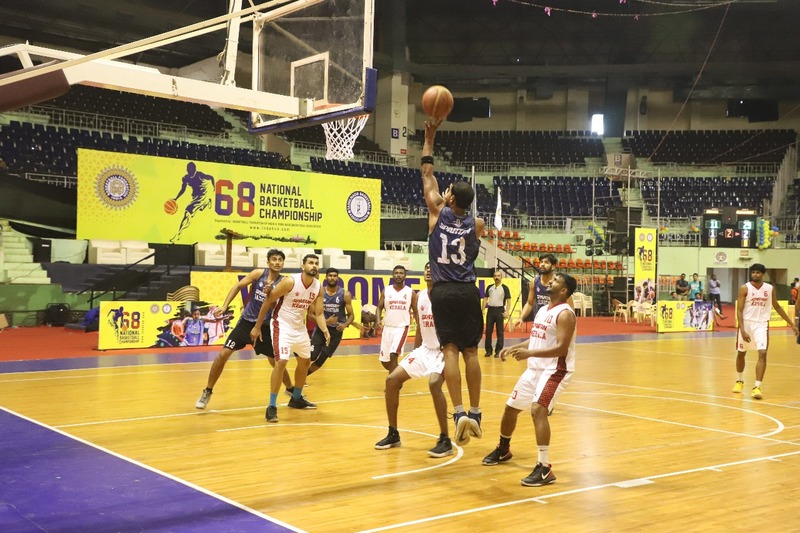 The second half of day two of the 68th National Basketball Championship for Men and Women continued to see fast and furious action. This men’s game saw Assam take on Bihar. A close game which saw Assam beat Bihar. The final score at the end of the four quarters was 64-56. The next game was the Karnataka women’s team take on the Kerala women’s team. A close game from the very beginning made it to extra time. The women from Karnataka were victorious at the end. The final score at the end of this high pressure was 70-67. The following women’s game was Delhi taking on Telangana where Delhi secured a comfortable victory over their opponents. The final score was 85-43. The next women’s game saw the hosts Tamilnadu take on Chhattisgarh. A close game from the very start they teams were tied at 77-77 at the end of the four quarters. The extra time saw both the teams put up a fight to the finish where Chhattisgarh team won. The final score was 93 – 85.